It is probably hard to imagine, but coins without dates pretty much dominated the ancient world. Symbols and rulers, including deities, took precedence over dates on coins. It seems that coin years or dates on coins were not important to the ancients. They were more interested to know who ruled than in which year a coin was issued. It is in many cases nearly impossible to pinpoint the exact year of issue when it comes to ancient coins without dates. In such instances, one can at best make educated guesses. This can be done by considering any symbols, including Mint marks, and rulers who might feature on a coin. The idea is then to try and match it to any historical records of the time that might exist today. This matchmaking can help to roughly determine the period a coin was issued, especially when a specific coiner’s Mint mark is present. Mint marks were introduced to be able to pinpoint the source when issues aroused pertaining to a coin’s content and quality. The gods had to help a coiner when found guilty of messing with a coin’s integrity, especially when a coin’s precious metals content was watered down without the consent of the king. Besides the primary use of coins as money or currency, coins were used as a mass communication medium in the projection of power. Coins were probably the only form of mass communication available at the time. This was long before the arrival of mass communication mediums such as newspapers, radio, television and the internet. A few examples of ancient coins without dates include the Indo-Scythian Silver Drachm that features King Azes I/II (35-12 BC) on horseback (obverse) and the Greek god, Zeus with scepter (reverse), the City State of Athens Silver Tetradrachm that features the Greek goddess Athena (obverse) and her helper the little owl – a symbol of wisdom – with an olive spray and the moon (reverse), the Tabaristan Silver Hemidrachm that features a side portrait of Sassanian King Khusru II (obverse) and a fire alter in Sassanian style bordered by concentric circles plus the Roman Empire Silver Denarius that features a side portrait of Gordian III (obverse) and the Roman goddess, Laetitia (reverse). It is possible to write volumes about dates on coins, including differentiating between the various systems that were developed to mark the passage of time. With this in mind, let’s consider some of the first coins with dates without getting bogged down with too much detail. According to The Guinness Book of World Records, a Samian Silver Tetradrachm struck in Zankle (modern-day Messina) in Sicily is the earliest coin with a date. It is dated year 1 (viz 494 BC) in the form of the letter ‘A’ at one end. 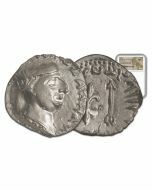 The same record reference book lists a Silver Penning (penny, pfenning, denier, denar) as the earliest Christian Era or AD dated coin. This coin was struck and/or issued by the Bishop of Roskilde, Denmark. This silver coin features a bishop’s hat on the reverse and a crown on the obverse. It also includes the legends +ANNO DOMINI on the obverse and the AD date MCCXXXIIII (1234) on the reverse. 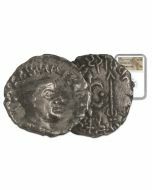 As the earliest European coin with a date, it is without a doubt, one of the most important pieces in European numismatic history. As a point of interest, Anno Domini (AD) is Medieval Latin for “in the year of the Lord.” AD and BC (before Christ) form part of the Julian and Gregorian calendars. The Gregorian calendar is a refinement of the Julian calendar and the civil calendar most often used in the world today. Staying in Europe, the Hungary Silver Denar with Madonna and Child (c. 1450-1620), is another coin with date that is well worth a mention. This silver coin, among the first to show a full date, features an image of the Madonna, the Patron Saint of Hungary, holding the baby Jesus (reverse). The legend “PATRO HVNGA” (“Patron Saint of Hungary”) followed by the full date (year) surround the Madonna and Child image. It is not uncommon to find the date of the flan or obscured - a result of crude coin manufacturing methods used at the time. The obverse features the Hungarian Royal Coat of Arms. British coins with dates started to appear the first time during the reign of King Edward VII. It became a common occurrence since that time. Before the arrival of dates on British coins, symbols such as anchors and crowns were used. These symbols or marks can be compared to government records in order to establish mintage numbers and the period a coin was issued. The first coins of the United States – those minted by the United States Mint - were all issued with dates. This practiced rolled over into modern U.S. coinage. U.S. coins without dates are normally coins that are worn, suffer as a result of Mint errors (e.g. U.S. Mint Dollar Error Blank Planchet - Type II No Date) or simply because someone decided to file the dates off. Dates on coins are, beyond its use for quality control purposes, markers of time and important persons and events. E.g. regnal years - years of reign - were used on some coins to show the progress of a reign. Not surprisingly, archaeologists find coins of great value, especially coins with dates. Coins can help in the dating of ancient materials. Dating is the process of establishing or estimating the age of ancient materials. It is of great importance when it comes to determining the chronology of events in times past. Coins with dates are said to fulfill the requirements of dating with undeniable proof of time. In addition, when coins are discovered during an archeological find, it can help to determine the earliest potential date. With the above in mind, it makes sense that for example, some coins with dates will be more collectible than similar coins of a different date in the same series. The really special and most valuable ones in a series are referred to as key dates. A combination of factors can play a role when it comes to determining key dates, including low mintages, mint errors, mintmarks, condition, collector demand, type of strike and more. The ones that are less rare, enjoy less demand or are more freely available are referred to as semi-key dates, or in short, semi-keys. The 1794 Silver Dollar (Flowing Hair Dollar) is a prime example of a key date. Thousands of collectors worldwide have to compete for a pool of only 1,758 – the total number minted. Another example of a key date that is demanding top dollar – even in low grades - is the 1909-S VDB Lincoln cent. This while the 1914-D and 1931-D can be described as semi-key dates in the Lincoln cent series. It might come as a surprise to learn that 484,000 of the 1909-S VDB Lincoln cents were minted. It should be evident that it is not a key date as a result of ultra-low mintage. It is a key date on the back of a great story combined with extremely high collector demand. It is a clear indication that thousands of collectors enjoy collecting Lincoln cents to some extent or another (or at the least appreciate the VDB story). The value of coins by year should never be underestimated – key dates can fetch hundreds and in some cases millions of dollars. New coin releases offer a great opportunity to cost-effectively acquire potential key dates. The sooner one taps into the value of coins by year in terms of buying, the better chances are that one will not miss out on the opportunity to own a key date at a great price. No guarantees can be given in terms of which new coin releases will turn out to be key dates. However, given the wealth of information that is available today, the discerning collector can immensely reduce the risks involved by narrowing down the selection of possible winners. Don’t hold me to it, but a coin that personally excites me as a potential key date is the 2017 Silver Krugerrand, especially in high grade. There are many collectors worldwide who collect Krugerrands the first-ever silver coin in the renowned Krugerrand series was a ground-breaking release. The excitement of potentially striking gold in the form of a key date with the purchase of a new release is second to none. Do keep in mind, like with all other coin purchases, that any such purchase should be driven by research, not hype. May your hunt for key dates be an exciting and rewarding experience! How is Value Determined in Numismatics?